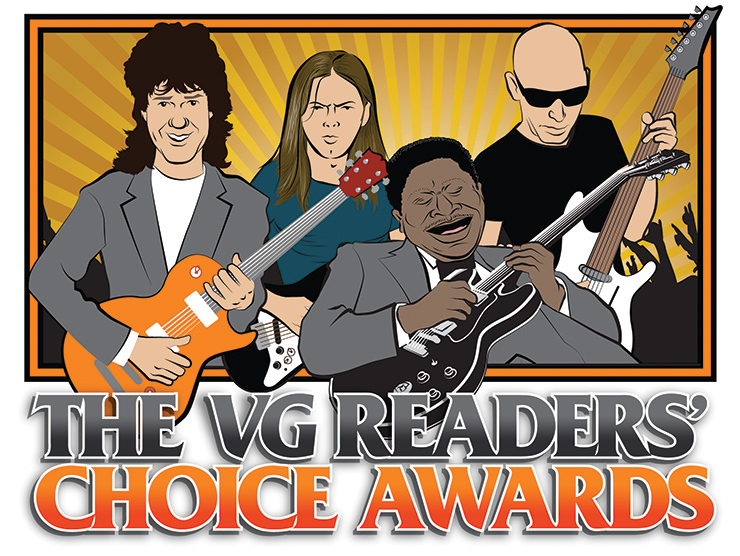 Each year, VG asks readers to select Readers’ Choice winners for Album of the Year, Artist of the Year, and Player of the Year in four musical categories, based on artists and recordings featured in the magazine between July 1, 2014, and June 30, 2015. Included in the annual vote are nominees for the VG Hall of Fame; each year, the magazine adds two players, an innovator, and an instrument. 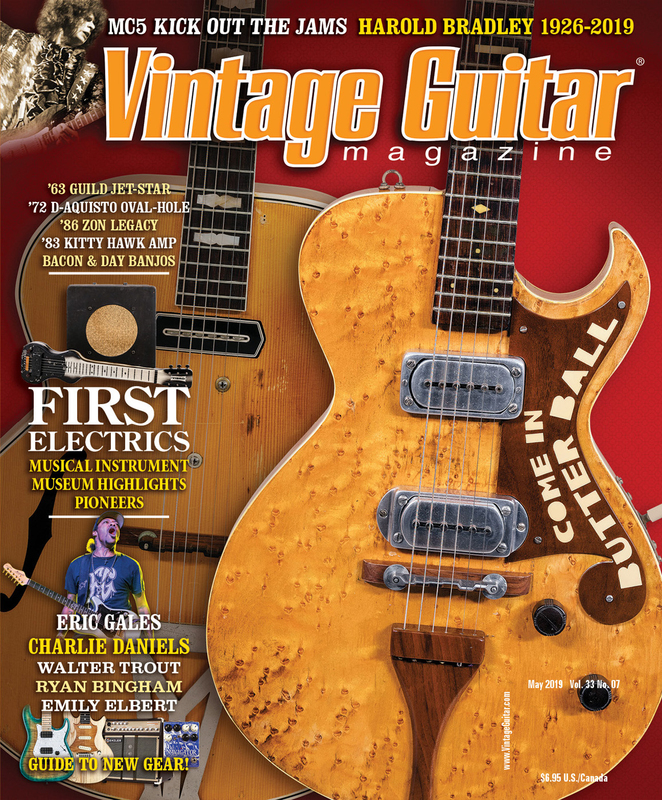 Hundreds of votes are tallied via the magazine’s traditional written ballot, while hundreds more participate at VintageGuitar.com. Here, we proudly present the 2015 inductees to the VG Hall of Fame. David Gilmour in concert in Munich, Germany. Photo courtesy of deep_schismic@flickr/Wikipedia. Pink Floyd holds few rivals. Propelled by insightful, pointed lyrics and deep-seated melodies, the band and its music are popular worldwide. Guitarist David Gilmour is one highly significant reason. Though Gilmour wasn’t around when the band was formed by four London art students in 1965, he was asked aboard in late ’67, after the release of its first album, the psychedelic masterpiece A Piper At the Gates of Dawn, and as the behavior of original guitarist Syd Barrett – spurred by deteriorating mental health – became increasingly unpredictable. Gilmour evolved into the band’s frontman and in some ways kept it afloat. In Gilmour, the band recruited a friend who was an able vocalist, but more importantly, devised licks as thoughtful and impassioned as the lyrics by bassist/co-vocalist Roger Waters. From 1968’s A Saucerful of Secrets through 1975’s Animals, the group released eight albums marked by bursts of unbridled creativity intertwined with infamous dry spells spurred by a mix of apathy and strained relationships. Still, the music has stood as testament to their skills as a unit – even the milestone 1980 album, The Wall, which was essentially a legal “settlement” between Waters and the rest. After the band split from Waters in the mid ’80s, a Gilmour-led lineup released A Momentary Lapse of Reason (1987) and The Division Bell (1994), both of which were huge sellers accompanied by equally huge tours. Not only is each Floyd song propelled rhythmically by an equally memorable Gilmour guitar phrase, he often interjects key licks between each line of lyric. In the minds of musicians, guitarists especially, those guitar parts are critical. And who among us hasn’t taken a run at the lead break on “Comfortably Numb” or grabbed an acoustic just to strum “Mother” or “Wish You Were Here”? 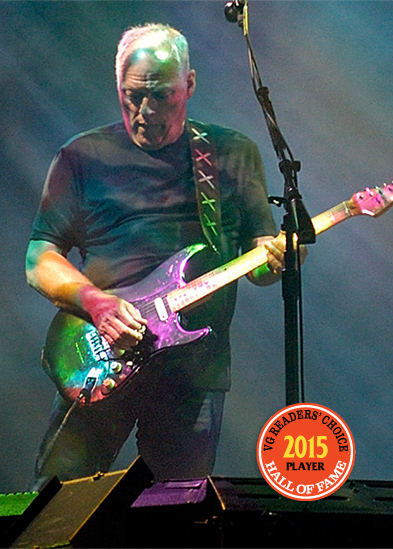 Through the height of his fame and popularity, Gilmour made heavy use of Fender Stratocasters, mostly with maple fretboards. The most prominent are an early-’70s model with a black pickguard and a red ’84 reissue with EMG pickups. He used a Telecaster to record A Saucerful of Secrets (1968) and for parts on other albums, and through the years has also tooled around on Les Pauls and a Gretsch Duo Jet, as well as an army of swirling, swishy, and echo-laced stompboxes. In 1978, Gilmour released a self-titled first solo album that charted in the U.K. and the U.S. His second, About Face, was released in 1984, and hit the U.K. Top 20. 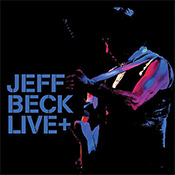 He has since released four more solo discs, including the 2015 effort, Rattle That Lock (in support of which he is touring the U.S. this year). In 1996, Pink Floyd was inducted in the Rock and Roll Hall of Fame; to date, the group has sold more than 250 million records. Gilmour has said its late-2014 effort, The Endless River, will be the band’s final album. Gary Moore courtesy of livepict/Wikipedia. 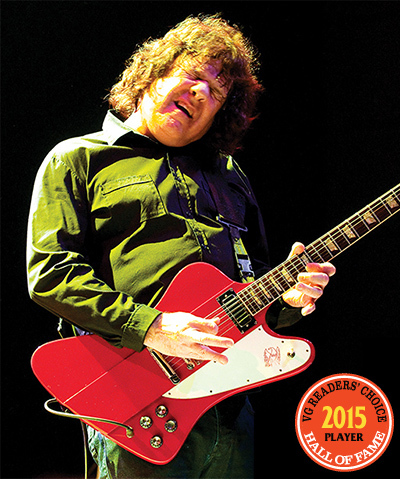 In his May ’04 “Fretprints” study, VG contributor Wolf Marshall dubbed Gary Moore an “unsung hero,” citing his virtuosity, diversity, and an uncompromising body of work. Critics would argue (and fans insist) that Moore was (and is) truly underappreciated; while the names of contemporaries like Van Halen, Young, and Blackmore are part of rock-guitar lexicon, Moore’s name typically requires a deeper dig. Fully capable in the areas of blues-rock, power pop, heavy metal, and even jazz-rock fusion, he built a reputation on two strong solo albums, Grinding Stone and Back on the Streets, and a stint in fellow Irishman Phil Lynott’s band, Thin Lizzy, where his playing and writing were a highlight of the 1979 album, Black Rose. Marshall cited Moore’s blues base and rock feel, but said he was separated from the pack in his ability to “season his improvisations with exotic note choices, fluid, technically adept passagework, a variety of textures, and unusual melodic patterns.” While Moore was in his element as a flashy lead player – Marshall cited his “myriad pinch harmonics, relentless cascades of pull-off and hammer-on licks [along with] long, complex modal runs often spanning two octaves, palm-muted flurries, tremolo-picked sequences, ostinato figures, and mutated high-velocity blues licks” – he also noted that Moore was a powerful, supportive rhythm player. Moore “met” music thanks to his father, a concert promoter in Belfast who organized events at a local ballroom. As a child, he took in many performances there, then began teaching himself guitar after hearing Hank Marvin, the Beatles, Jeff Beck in the Yardbirds, Eric Clapton, and Peter Green. In the early ’70s, Moore’s band, Skid Row, opened a show for Frank Zappa at the Fillmore West in San Francisco; Zappa’s playing introduced the young rocker to jazzier styles that he immediately began to adapt. He would be similarly influenced by Chick Corea and Ollie Halsall. When he began to focus on blues, he reported taking to heed advice from blues master Albert King when they worked together on Still Got The Blues. In a 2008 interview with VG, Moore related to Lisa Sharken how King told him, “Gary, play every other lick.” The profound advice shaped Moore’s style, and taught him not only to leave that space, but focus on tone and expressiveness. 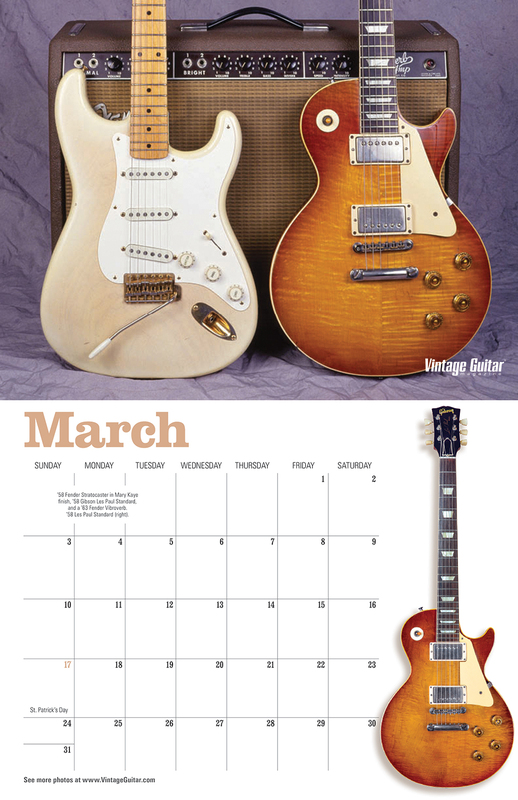 Coinciding with his stylistic shifts, Moore pursued tones through a variety of guitars and amps, including a Shell Pink ’60 Strat in his early solo work, followed by the ’59 Les Paul Standard he borrowed from Peter Green in 1970; they soon after agreed to $300 in exchange, and it served as Moore’s go-to guitar for the next 25 years, appearing famously on trademark tracks like 1979’s “Parisienne Walkways” and his 1990 hit “Still Got the Blues” which is on a short list of tunes cited as the ultimate example of Les-Paul-through-Marshall tone. 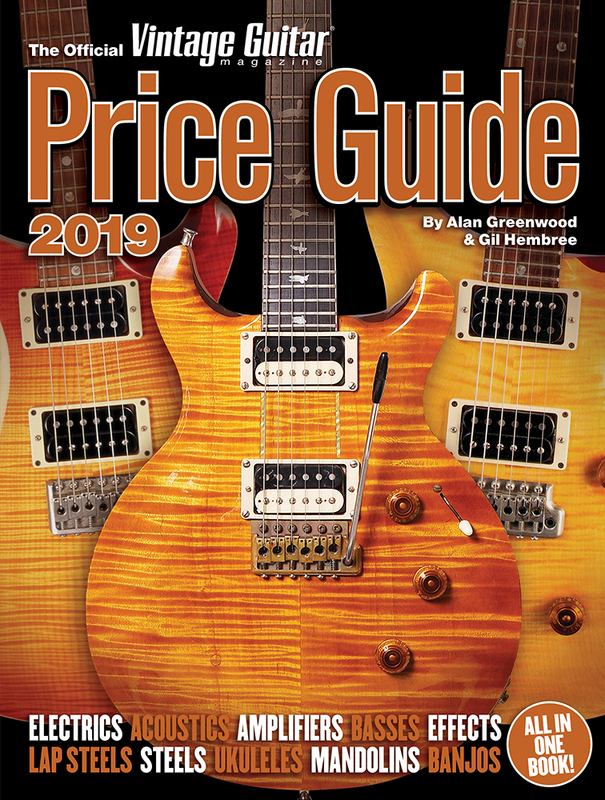 Other instruments included various custom Charvel, Hamer, and Ibanez models in the mid ’80s, then various vintage Gibsons, including a ’55 Les Paul Junior, an Explorer, Flying V, a ’55 ES-5, a ES-345, and a Melody Maker. With Skid Row and for his ’70s solo work, Moore plugged into Hi-Watt amplifiers. With Thin Lizzy, it was two 100-watt Marshall stacks and half-stacks, then in the ’80s, he developed a preference for Soldano SLO-100 heads. In 2008, critics lauded Bad For You Baby as his finest album in years. He died February 6, 2011, at the age of 58. (LEFT) Fender Champ 5E1 and a 5F1. 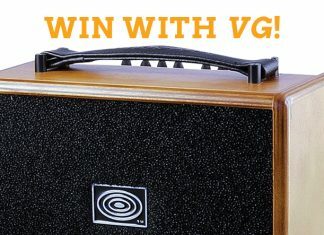 Fender Champs courtesy of VG Archive. Amid all the cute (yet potent) single-ended “student” amps to come out of the ’50s and early ’60s, Fender’s 5E1 and 5F1 models were, well, the Champs. About the size of the lunchbox your grandpa took along to work every morning, loaded with three tubes – a single preamp tube, single power tube, and single rectifier tube – and putting out a nominal four watts into the smallest speaker you’ll find in a guitar amp, this thing punched way above its weight, and made surprisingly easy and swift work of gaining its classic status. The diminutive looks alone are enough to make the Champ appealing. Awww, it’s a baby Fender! 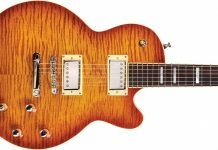 But stand back – this puppy has teeth, and it unveiled them time and again on legendary recordings by Eric Clapton, Joe Walsh, Joe Perry, Billy Gibbons, Jeff Beck and scads of others. 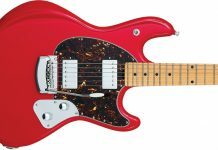 Keep the Champ’s lone Volume control down below about five (on a scale that goes to 12 – take that, Nigel Tufnel) and it purrs, twangs and squawks the way a student model was intended to do. Roll it up past six, however, and it segues into a juicy, harmonically saturated roar that defines raunchy rock and roll. Part of the beauty of the circuit is its inherently, definitively Class-A operation. 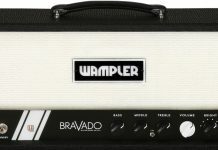 Since you are pushing just one output tube, a 6V6GT, this amp has no choice but to run in pure Class A, as defined by the tube amplifying the signal during the entire wave cycle, rather than sharing the effort with a push/pull partner. In front of that 6V6GT we get two stages from the amp’s single 12AX7 twin-triode preamp tube – one for the first gain stage, another for the output driver – and fewer than 10 solder joints in play from input jack to output transformer. The handful of resistors are all pulling other duties, and your signal passes through none of them after the obligatory 68k grid-stopper that follows each of two input jacks, running through just a pair of beautiful, big, yellow Astron.02µF coupling caps along its sonically edifying journey. 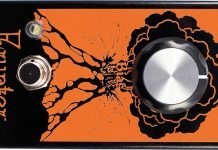 No tone control, no bright switch, no nothin’. Even the on/off switch is on the back of the volume pot. 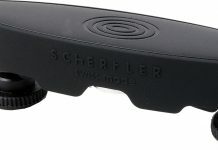 You want to hear your electric guitar amplified purely and simply? This is it. It’s the sound tubes, a handful of components, and ultimately, graunchy multi-dimensional bliss. 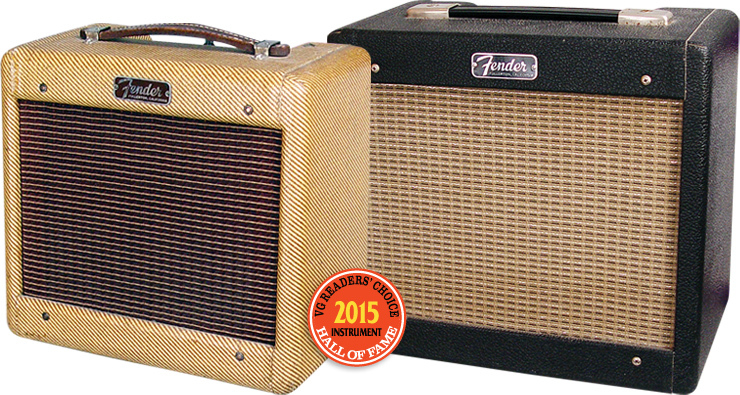 The Champ evolved some from the mid ’50s and into the ’60s, but less than many other Fender amps. The first of the seminal narrow-panel tweed Champs, the 5E1 of 1955, had a choke in its power-filtering stage and a 6” speaker in a cab that measured 11” x 12” x 7.5”. In late 1956, the 5F1 dropped the choke, gained an 8” speaker, and migrated to a slightly larger cab that added an inch and a half to its height and width, and half an inch to its depth. In addition to being extremely popular, the Champ was literally Fender’s last production tweed amp; it maintained this same circuit and it’s narrow-panel cab with upper-rear-mounted chassis until 1964, four years after the introduction of the front-mounted Tolex amps, although it too was covered in Tolex for its last year or two of production. George Beauchamp’s importance in guitar history is often overlooked – at least in part because his name never appeared on an instrument. Nonetheless he was a pioneer of amplification, perhaps the single most important contributor to the birth of the electric guitar. In the mid-1920’s Beauchamp, a vaudeville Hawaiian guitarist, commissioned the Dopyera brothers of Los Angeles to build a guitar with a resonating metal cone instead of a wooden soundboard. This collaborative project led to an entirely new family of Tri-Cone resonator string instruments under the “National” brand that were absolutely unique. The company set up to manufacture them had Beauchamp as manager and John Dopyera as designer, but the two soon fell out. Dopyera left in early 1929, leaving Beauchamp to launch National’s single-cone resonator guitars, extremely popular at the time and still a favorite of blues players today. With Jimmy Hall providing vocals, Beck digs into “Morning Dew,” Stevie Wonder’s “Superstition,” and Sam Cooke’s “A Change Is Gonna Come.” Then, there is a fantastic instrumental versions of the Mahavishnu Orchestra’s “You Know You Know,” followed by a blend of rock with R&B on “Why Give It Away,” its solo heavy with Uni Vibe-like effects and nasty bends. The Beatles’ “A Day In The Life” is masterfully reinvented, as are the ballads “Where Were You” and “Danny Boy,” where Beck renders “breathtaking” pedal-steel effects, swells, and reverb. Joe Satriani courtesy of Chapman Baehler. 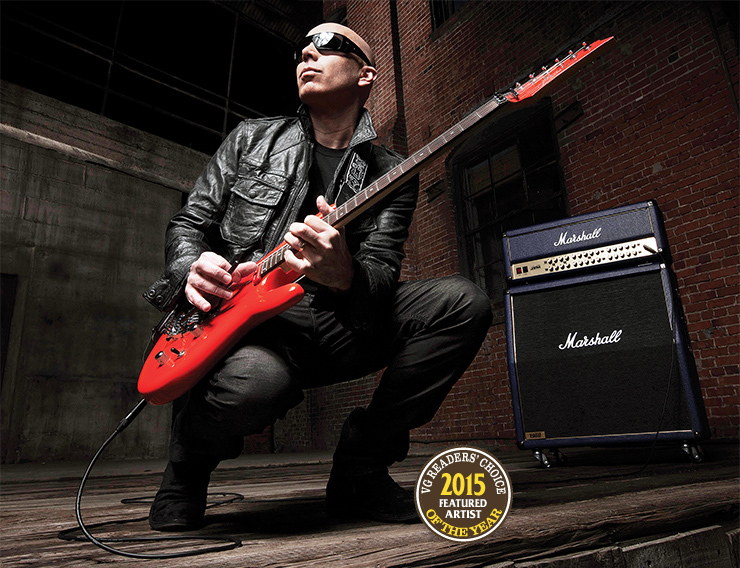 VG featured Joe Satriani as his latest album, Shockwave Supernova was beginning to hit eardrums around the world. A concept effort noted by interviewer Oscar Jordan for tunes that bridged the gap between traditional blues and the fiery compositions adored by Satch fans, it offered a host of new elements. Satriani emerged in the late ’80s playing a mix of classical and classic rock influenced by Hendrix and Page, onstage with the help of Ibanez signature models, in the studio often with vintage guitars and amps. In the three decades since releasing his debut, Not of This Earth, he has sold more than 10 million albums while garnering 15 Grammy nominations to go with his six gold and platinum discs (including gold for the debut album by the band Chickenfoot, which includes frontman Sammy Hagar, bassist Michael Anthony, and drummer Chad Smith). 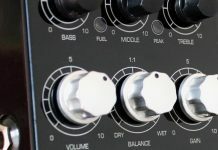 In discussing the new album, Satriani admitted the inherent risk in offering the thematic 15-song effort, which tells the tale of guitarist Shockwave Supernova, who relies on an alterego in order to perform. Like so many things for so many guitarists, it was inspired, he noted, by one James Marshall Hendrix. Satriani developed the concept of Shockwave Supernova without any sort of direct narrative. Rather, he wanted to make creative decisions song by song, and explore moods as they related to the character – loose and free-form, but with an overall tone. 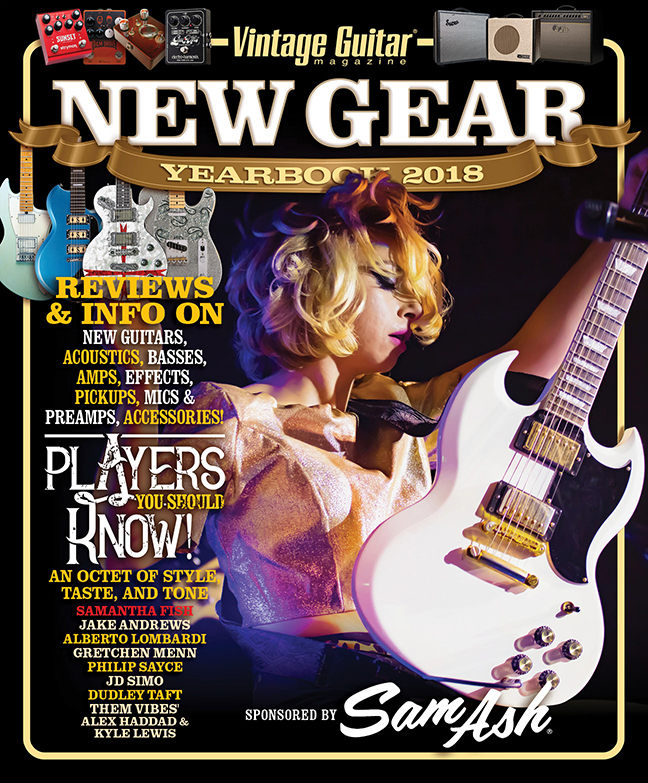 In its recording, Satch eschwed the traditional use of amps, opting instead to develop tones via software plug-ins, then with help from John Cuniberti, he created demos running into a SansAmp and a Guitar Rig. Once he’d devised suitable guitar sounds, they ran them out of ProTools and back into Satriani’s Marshalls or Fender tweed combos. Brad Paisley courtesy of Craig O’Neal/Wikipedia. As far as anyone knows, the first country singer to use an amplified guitar and play his own leads was Texas honky tonk vocalist/songwriter Floyd Tillman. Some vocalists playing electric guitars became distinctive instrumental stylists; Merle Travis was one. Add to that Joe Maphis, Buck Owens, Don Rich, Roy Clark, Glen Campbell, Willie Nelson. 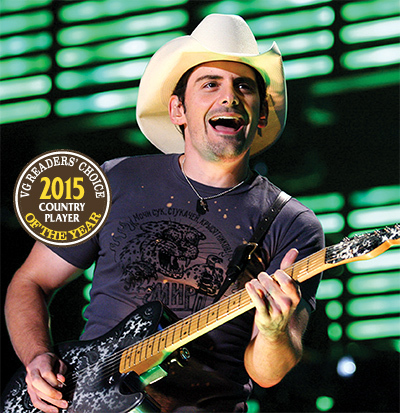 In more recent decades, that elite group’s expanded to accommodate Steve Wariner, Albert Lee, Bill Kirchen, Vince Gill, Keith Urban – and Brad Paisley. Whether soloing amid a vocal performance or unleashing one of his explosive instrumentals, Paisley’s picking blends flash, dazzling virtuosity and velocity while remaining solid and musical. 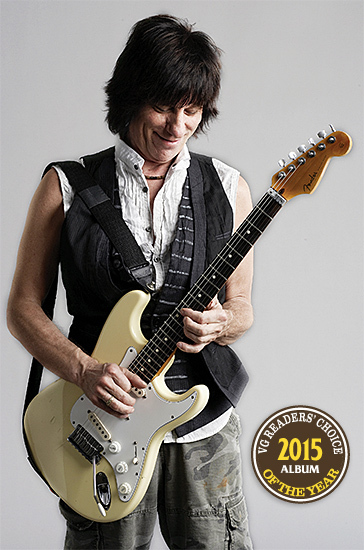 His style is an amalgam of his heroes: James Burton, Buck and Don, Roy Nichols, Ray Flacke, Albert Lee and Gill while revealing the influence of Clarence White and other B-bender players. Paisley, inspired by Diamond Rio guitarist Jimmy Olander, favors a G-bender. Born and raised in the Ohio River town of Glen Dale, West Virginia, Paisley seemed destined for a musical career. His maternal grandfather Warren Jarvis was a retired railroad worker and amateur but passionate country musician. Sensing the gift in his grandson, on Christmas Day, 1980 eight year old Paisley found a Silvertone 1448 amp-in-case model under the tree. Jarvis got him started, then sent him to local guitar great Hank Goddard, who introduced Paisley to the fingerstyle playing of Chet Atkins and the mainstream jazz playing of Johnny Smith and Tal Farlow. The teenaged Paisley didn’t live by country alone, however. He loved and absorbed the rock guitar titans known to his friends – Eddie Van Halen, Eric Clapton, Richie Sambora, Billy Gibbons, and Angus Young. Playing country at a local event landed him a guest spot on nearby Wheeling’s venerable Grand Ole Opry-like “Jamboree USA,” earning him a place on the show’s regular cast. Committed to a performing career by then, he earned a Music Business Administration Degree at Nashville’s Belmont University. Country-guitar albums were long passé when Paisley used the creative control that accompanies hit singles and albums to record the largely instrumental Play. He swapped licks with B.B. King on “Let The Good Times Roll” and sang “Start A Band” the album’s hit single, with Keith Urban. Wariner joined him for “More Than Just This Song,” honoring deceased mentors, Paisley paying tribute to Goddard and Wariner saluting Chet Atkins. On the Grammy-winning “Cluster Pluck,” Paisley swapped licks with his Telecaster heroes – Burton, Lee, Wariner, Brent Mason, Gill, Volkaert, and Jon Jorgenson. “Les Is More” revealed his jazz chops. His playing remains an integral part of his music onstage and on record, and in an era of Autotune, it’s clear he can handle himself as well with an acoustic guitar and a microphone as he can with a full band in a stadium. Eighteen years after his debut, Paisley remains a star of the first magnitude, achieving lasting fame and straddling the considerable divide between contemporary and traditional country – no small feat. His tours are events; he’s marketed and merchandised, yet beneath it all is an artist to whom music – always music – rules. Warren Haynes courtesy of Anna Weber. 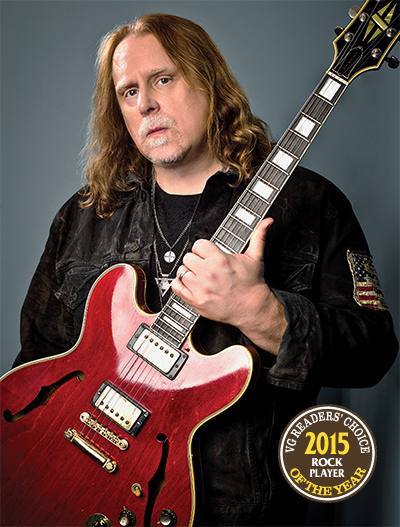 Warren Haynes could hold a lot of titles, including “busiest man in rock and roll.” Most fans know him as a guitarist in two versions of the Allman Brothers Band, but his resumé is full of other gigs for which guitarists would be chomping at the bit. As fellow southern guitarist, Greg Martin, points out, Haynes has paid his dues. At the time, the Allman Brothers were strong and vibrant after rebounding from a period where their music didn’t meet previously high standards. Haynes recalled that the original Allman Brothers were among his biggest influences, today, a new generation that included Scott Sharrard (now Gregg Allman’s guitarist and musical director) would find the Betts/Haynes combo inspirational. After a long run, Haynes and the late bassist Allen Woody started Gov’t Mule, a band that recorded albums and concerts that included visits from various friends along the way. One of them was jazz great John Scofield. Early 2015 saw the release of a two-hour set recorded in the band’s early days, with Scofield sitting in. Called Sco-Mule, its initial release was set back with the August ’00 passing of Woody – and other things. The music is fun and intense and Scofield said a lot of that has to do with Haynes. Haynes is also involved in various Grateful Dead reunion shows, has popped up at Dave Matthews Band concerts, recently helped the Allmans wrap up their career as a unit, and appeared on countless stages and in studios as a guest. 2015 also saw the release of his first solo album in four years, Ashes & Dust. Its quieter tone was in contrast to 2011’s Man in Motion, but it served to showcase his versatility and sometimes underutilized vocal abilities. As if he’s not busy enough, Haynes finds time every year to help his home town of Ashville, North Carolina, with his annual Christmas Jam. It started with local musicians getting together to raise money for various charities. Last year, they featured various major acts and raised money for Habitat For Humanity. Al Di Meola courtesy of gorupdebesanez/Wikipedia. 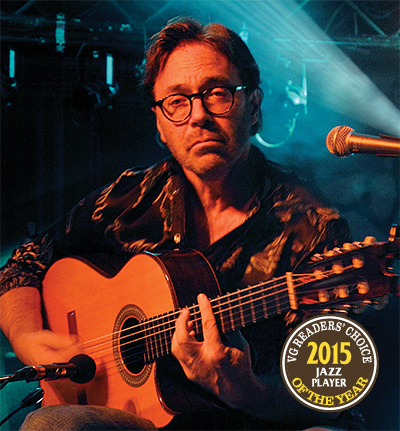 Never one to sugarcoat his views, Di Meola always speaks his truth. His opinions are supported by a successful 40-year career of adventurous music with more than 24 solo albums, group projects, guest appearances, and millions sold. Avoiding the bop phrasing born from American swing and blues as a veneer for soul, Di Meola favors the sensuality of Latin romanticism. A disciple of Tal Farlow, Kenny Burrell, and Larry Coryell, his big break came while a student at Boston’s Berklee College of Music. After seeing a live performance of Return To Forever with Earl Klugh filling in for Bill Connors on guitar, a 19-year-old Di Meola decided he had to be in that band. He joined Return To Forever in 1974 and recorded the iconic fusion albums Where Have I Known You Before, No Mystery, and Romantic Warrior before the group disbanded in ’76. Return To Forever’s break-up allowed Di Meola to pursue a solo career that remains a major influence on guitarists to this day. Retaining the melodicism of Chick Corea, his love of Latin music, and the knowledge that jazz doesn’t always have to swing, Di Meola positioned his guitar front and center. The albums Land Of The Midnight Sun, Elegant Gypsy, and Casino were a huge influence on rock, jazz, and fusion guitarists, and while they continue to receive high praise, it’s his later work that displays his true genius as a composer. It was “Flight Over Rio,” “Race With Devil On Spanish Highway,” and “Egyptian Danza,” that introduced a generation to Di Meola’s warp-speed alternate picking, immaculate articulation, and signature “Mutola” effect. His evocative cross-cultural lyricism meshed imaginatively with the percussive staccato of his guitar strings, harmonic sophistication, and chromatic crescendos. These recordings sent many guitarists to the woodshed. Among those fans is a who’s who of guitarists that arguably includes every shredder who began their careers in the 1980s. Unceasingly prolific, Di Meola eventually drifted away from electric fusion, due to tinnitus. The last of that era were the albums Splendido Hotel, Electric Rendezvous, and Scenario, with keyboardist Jan Hammer. This led to more compelling acoustic compositions that showcased the depth of his composing as heard on Cielo e Terra, Kiss My Axe, and Orange And Blue. Exploring tango, flamenco, the music of Brazil, and the Middle East, he soon replaced Larry Coryell in The Guitar Trio that featured John McLaughlin and Paco de Lucia. This culminated in the 1981 release of one of the most popular acoustic albums of all time, Friday Night In San Francisco. In ’95, he joined bassist Stanley Clarke and violinist Jean-Luc Ponty for The Rite of Strings, which was recorded after their world tour. Di Meola’s World Sinfonia pushed the boundaries of acoustic fusion by incorporating jazz harmony with South-American landscapes. His interest in Argentinian tango legend Astor Piazolla spawned the critically acclaimed tribute album Di Meola Plays Piazolla. The new millennium saw Di Meola continue his use of lush textures, cutting edge technology, complex syncopation, and spellbinding sense of clave. Flesh On Flesh, Consequence of Chaos, and Diabolic Inventions And Seduction For Solo Guitar, are but a few of the highlights. B.B. King courtesy of Heinrich Klaffs/Wikipedia. When B.B. King passed in May of 2015, VG fielded an unprecedented volume of correspondence from guitarists of all ilks and points in the hierarchy. Their reverence was obvious and well-stated. Born Riley B. King on September 16, 1925, in Itta Bena, Mississippi, a teacher inspired him to seek a life beyond sharecropping and a preacher introduced him to the guitar. Following the path set by T-Bone Walker, he transitioned from radio entertainer to, by the late ’40s, building a reputation around the South as the Beale Street Blues Boy. He scored his first #1 hit, “Three O’Clock Blues,” in 1951 after recording it at Sun Studios. King was truly peerless. Beyond his ability to pull up an audience up via a single long, vibratoed note, he exhibited an incomparable charisma and style, and his influence carried far beyond the way he plucked a guitar. Anyone who shared even a moment with King tells of his generous nature, and those who witnessed a performance by the man in his prime can readily recall the drama and energy of the event. 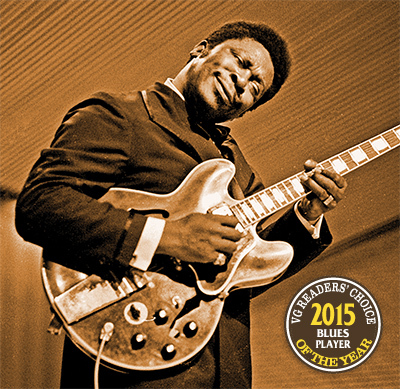 The list of players affected and influenced by King reads like the proverbial “who’s who,” and includes many modern guitar heres – Eric Clapton, Buddy Guy, Carlos Santana, George Benson, Larry Carlton, Mark Knopfler, and Otis Rush have all related his impact, borrowed his licks, or exhibited the obvious influence of his phrasing, as did late legends Mike Bloomfield, Jimi Hendrix, and Stevie Ray Vaughan. “The gifts B.B. gave us will be with us forever – a legacy of class, style, and a bagful of blue notes that will be played every day, but never quite as soulful as when he played them,” said Steve Lukather. “B.B. King will always be one of those giants inspiring in me the belief that it might be possible to spend a life in music, and that playing the guitar is a worthy endeavor,” recalled Bill Frisell. “It’s hard to imagine him gone. The first time I saw him live was in the mid ’70s at Paul’s Mall, in Boston. I was in the first row, inches from the stage. The band came out without him and sounded incredible. Then, he walked on, and with his first note – one note – stunned! He brought the level up about a thousand notches. I’ve never heard that kind of power. The beautiful kind. What a night. I’ll never forget it.